Below is a list of upcoming Christmas Craft & Food Markets from around the country. 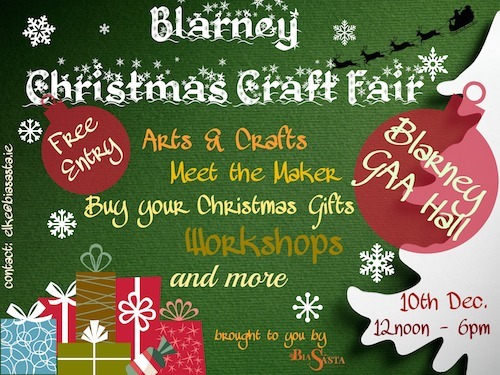 If you know about a market that is not listed, please email elke@biasasta.ie with the details. Please note: the listing is not chronological and not sorted by county/location. The title of each market is a link that bring you to the event website. 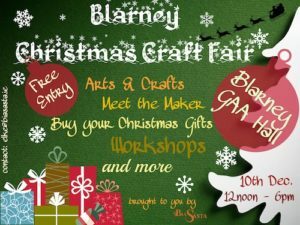 10th Dec. 12noon – 6pm: Blarney GAA Hall, Co. Cork. Meet the Makers, learn new skills at one of the workshops, browse and buy your Christmas Gifts or simply enjoy the festive atmosphere. 19th – 20th Nov. 10am-6pm: Tramore Art Craft & Design Winter Craft Fair Nov 19th and 20th 2016. Location: Christ Church School Hall .Church Road Tramore Co Waterford. Open Sat 10 – 6 and Sunday 12 – 6. Admission free ,Parking available and all are welcome. 11th Dec. 10:30am – 6pm: The Séamus Ennis Arts Centre, Main St., Naul, Dublin. Enjoy the festive atmosphere with a glass of mulled wine while browsing a large selection of seasonal, high quality, crafts and food. As well as The Handmade Soap Company, you’ll find pottery, jewellery, stained glass, beautiful children’s felt clothing, willow baskets, woodcarving products, mosaics, knitted & crocheted crafts, fabric toys, jams & chutneys, olives, Christmas cakes & puddings, free range meats & pork, mince pies, farmhouse cheeses and much, much more. 26th Nov. – 3rd Dec. 1pm – 6pm: Franciscan Well, Cork. For the first year we are holding Arts & Crafts Christmas Market in our beer garden to help support some local artists. We will run it Saturdays & Sundays from 1pm-6pm starting November 26th and ending on Sunday the 19th. We have a great selection of local artists lined up to sell their work along with the chance to buy our Christmas Franciscan Well hampers. This will be a great place for people to buy unusual handmade gifts for Christmas. Our renowned beer garden will also be transformed into a winter wonderland, Pompeii will be serving their usual amazing wood fired pizzas and we will offer hot cider, whiskey and port, coffees and teas at the bar! 27th Nov. 12noon – 4pm: The Donkey Sanctuary, Liscaroll, Mallow, Co. Cork. Come along to our Christmas Extravaganza and meet our beautiful donkeys! Enjoy a very unique experience and browse through over 30 different stalls selling a range of goods. We will have a wheel of fortune on the day and we will have Andrew from Kids Sand Art Magic which is a fantastic activity for kids and he also offers take home packs to keep kids entertained at home. See more info here http://www.kidssandartmagic.ie/ Kids will have the option of grooming some of our quietest and most gentle donkeys. Buy some beautiful Christmas presents from our artisan trade stands as well as our Donkey Sanctuary stock. There will be a food court on the day where you can treat yourself to some delicious hot meals and treats! Monster raffle on the day with a beautiful Christmas atmosphere. Santa will not be present at this years event, we are sorry for any inconvenience caused. 19th Nov. 11am – 6pm: Smock Alley Theatre, Lower Exchange St. Dublin. An annual one-day creative conference, workshops & design fair featuring some of the most interesting names in creative business in Dublin TALK series curated by Just Six Degrees, HunReal Issues and Slow Series. Listen to presentations and panel discussions focusing on honest discussion of the real experience of the creative business owner in Ireland. Learn about the tools, motivation and specific supports available as innovative speakers share their successes and failures as well as the pitfalls of self-employment in creative industries. WORKSHOP curated by Local Enterprise Office and hosted by Tara Prendergast, founder of Biscuit. Discover practical and useful steps to getting your creative business off the ground with LEO’s panel of business experts. CHRISTMAS DESIGN FAIR is FREE and celebrates contemporary design in Ireland. Our stall holders range from illustrators to textile artists, paper designers to goldsmiths and everything in between. Discover and buy from small creative studios which are still finding their feet in the retail & commercial sector. The perfect opportunity to buy unique Christmas presents for those around you while supporting up and coming designers. 17th Nov. 7:30pm – 11pm: Longueville House, Mallow, Co. Cork. Gather together some Friends, Family or Work Colleagues for a Girls pre-Christmas night out. Longueville House becomes a mini department store for one night only when a carefully edited selection of vendors set up shop in the hotel’s bedrooms, restaurant and public areas. The invited vendors have been selected for their quirkiness, innate style and unique quality items. There will be special offers and discounts to tempt guests to loosen their purse strings. Beauty Products, Ceramics, Children’s Toys & Clothing, Fragrances & Candles, Interior Design Accessories, Millinery, Fine Jewellery & Costume Jewellery, The Latest Fashion, Leathers, Longueville Artisan Festive Food & Beverages and so much more! This allows you to do your Christmas shopping in civilised surroundings, without traffic and parking woes. There will be a party atmosphere fuelled by mulled cider, bubbly & driver cocktails with tasty nibbles on arrival. Afterwards chat and wander through the rooms of Longueville. It really is the event for serious socialisers and shoppers! 4th Dec. 10am – 6pm: Kilmalooda House, Timoleague, Co. Cork. The Christmas Market will include up to 35 stallholders offering a vast range of homemade festive and other products, including, food, beverages, preserves, chocolate, Christmas puddings, art and crafts, glassware, pottery, vintage clothing, artist work, prints, hampers photography, craft jewellery, skincare, metal figure displays, bric-a-brac, to name just a few. Come along and join in the good cheer and the unique atmosphere, with lovely open fires and festive music. There will be ample marshalled parking and outdoor tented stalls offering a range of hot foods. Tea, Coffee, Mulled Wine, Mince Pies and soup and Sandwiches will also be available to purchase all day inside and outdoors..
19th – 20th Nov. 10am – 4pm: Village Hall, 4 St Patrick’s Quay, Cork City. Stock up on designer threads, retro goods, vinyl records and affordable furniture in beautiful upstairs hall. Hand picked market traders sell everything from vintage clothes and homeware to art and skateboards. 19th – 20th Nov. 10am – 6pm: Ballymaloe House, Shanagarry, Co. Cork. This is the 7th year of the Ballymaloe Craft Fair and 2016 continues to showcase work by more than 100 of Ireland’s best craft professionals throughout the Ballymaloe Grainstore and The Big Shed on Saturday 19 and Sunday 20 November between10am – 6pm. Christmas shoppers will be spoilt for choice among more than 100 stands offering fine textiles, pottery, jewelry, wood and glass work, paper crafts, fine art, children’s toys and dolls, cosmetics, confectionery, knit wear, and much more. 24th – 27th Nov. 11am – 9m (Thurs & Fri), 10am – 6pm (Sat & Fri): City Hall, Cork City. there are thousands of unique gift items to choose from, and when all of the gifts have been bought then maybe you can find time to pick up a treat for yourself. The City Hall Crafts & Design Fair is a celebration of the best of Irish Craft and artisan food producers and we appreciate all of your support for the talented makers who take part. We will look forward to celebrating the next 25 years of this wonderful event in Cork City. 5th Nov. – 17th Dec. 11am – 5pm: St Peter’s Church, North Main St. Cork City. Every Saturday from 5th November until December 17th at our indoor Saturday vintage, handmade and bespoke market at St.Peters North Main St Cork. Clothing, gifts, food, homewares and much more. 25th Nov. – 23rd Dec. 11am – 8pm: Waterford City. Winterval, Ireland’s largest Christmas festival, takes place in the heart of medieval Waterford and is packed with seasonal events & activities for young & old. With a sparkling programme of 30 events, many of which are free of charge, #Winterval2016 is set to be the biggest and best festival yet. Winterval Festival will take place each weekend from November 25th to December 23rd, 2016. For full details on festival dates, and to view our full programme of events, please see www.winterval.ie. 13th Nov. 11am – 4pm: Black Lion, Greystones, Co. Wicklow. Please join Greystones Educate Together National School on Sunday November 13th, for the 5th annual Craft Fair. With four years under our belt, we continue to strive to present one of the best fairs in Wicklow. Vendors including local artists, artisans and craft people, will showcase quality and carefully selected, handmade products and delicious treats. There will be a fantasic children’s craft area, face painting, and the return of archery and more– fun for the entire family! With the café stocked to the brim with lovely cakes, cookies and savouries – the day is sure to be stellar! Spread the word and come along to enjoy another colourful event with us this year. We appreciate any local support to make this event a successful experinece for anyone taking part. 9th – 11th Dec. 1pm – 7pm: Haymarket, Smithfield Square, Dublin. CHRISTMAS BAZAAR in Block B, Haymarket just off Smithfield Sq, D7, will be one of Dublin’s biggest indoor Christmas markets, with over 100 stall holders, food market, live music & dj’s, pop up xmas cafe!